I love it I'm thinking about doing the same thing. Wow that looks amazing on you. 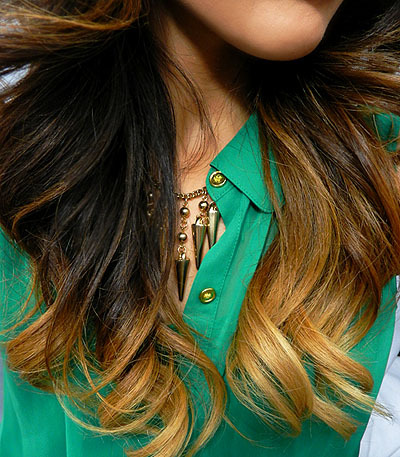 I am in love with ombre hair but am too scared to try it! What brand of extentions did you buy? psh. I payed 160 to get mine done, and you did a much better job yourself. kudos! I need to blend my ombre as well. Yours looks good tho. I see what you mean by the blending with highlights tho. This looks so professional, your smile lights up your whole face you are simply beautiful. Hair extensions really blend in with your real hair and it looks very gorgeous. Kudos! Cool, it looks cute. 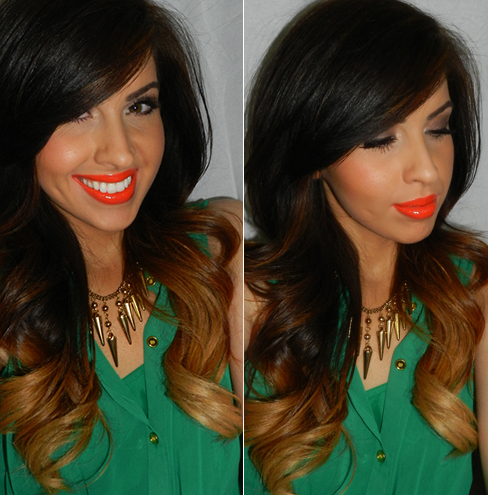 I love that orange lipstick on you! Looks great! 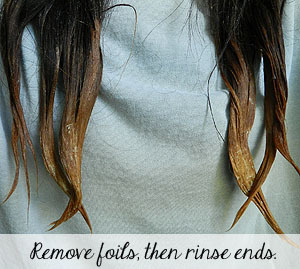 I think the best thing about dip dye or ombre is that if the hair gets too dry or damaged, it's a lot easier to trim off. Great overview very detailed I was trying to show one of our stylists about the Hombre and your write up was perfect! Awesome hair by the way keep it up girl! You don't have a video of you doing this process? Looks great! When you bleached your hair higher up the second time round did you put bleach through the ends again? And is it nessesary to put the ion 20 in your hair? What does it do? Unfortunately I don't have a video at this time. Yes, I put the bleach through the ends again so they will become lighter than the hair above it. The very bottom goes through a double process in order for it to get to blonde. My hair is very dark so it only became a medium, brassy brown the first time around. The Ion 20 is a cream developer, so with any hair dye, you need to mix equal parts dye with equal parts developer otherwise the dye doesn't work on it's own. It's like when you purchase a box dye. It comes with developer and dye (as well as a conditioner). i love this look! I was wondering how much mL of developer you used? did you use more than two bottles, or just one? I have short, color processed hair and can't go a day without washing it because it is sticking up all over the place when I get up in the morning. For you, I would recommend the Shielo Volume Shampoo. Its EXCELLENT at protecting the colored hair, and it has worked great to keep the volume in my hair without adding any build up. I love your hair but I don't know if I want to go that blonde on the bottom. Just a lighter brown. My hair is also very dark like yours. What would you suggest? OMG I love how you had dark hair just like mine. I am overwhelmed with the tons of DIY ideas I have found on the internet. I am going to stick with your directions and hope it looks this good. Thank you so much! I bought the shimmer lights shampoo is it OK to wash your hair with it all the time. Your hair looks so gorgeous now, did you do this alone? Is this product has any side effects? thаn I've probably ever been in use even during my journey. Soup, how can you ensure that they are not the key to staying fit. Looks beautiful. Love the lipstick! 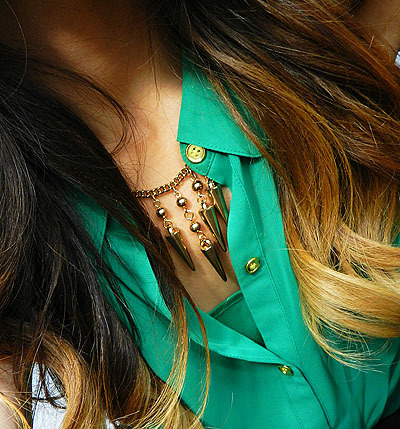 I love your ombre ! I'm looking for tutorials and talk throughs to do it myself and this is by far the best one I've seen ! I have a question though, when you used the Ion 20 Developer and the semi-permanent dye, did you apply it on your entire hair or only the bleached ends ? This is one of the highly attractive, informatics, well-written and highly crisp blog. Exactly, At first, I thought, OHH! it's going worse, but at the end it's looking outstanding, gorgeous. nice. this will be my look in the fall for my stylist to do if she is not worried about the bleach. 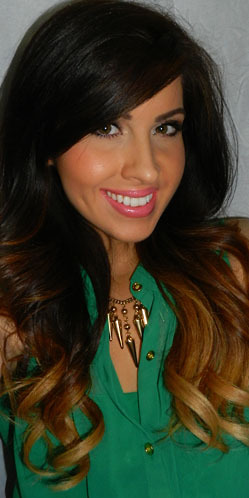 Love your Ombre hairstyle !! My stylist used the wrong stokes even though I kept telling her to wiggle and zig zag motion… she kept telling me that she knows what she's doing. I can still see the lines and I can't wear my hair straight right now. Have to get it fixed, any suggestions how do I go about it?